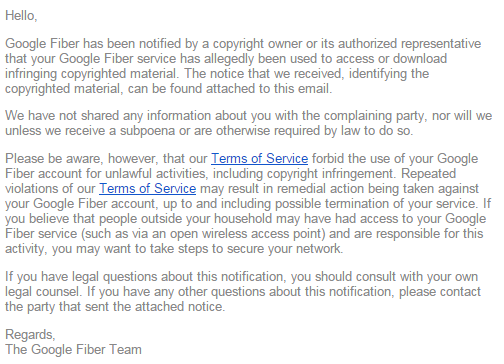 Google Fiber is forwarding copyright infringement notices to its subscribers including controversial and automated piracy fines. Through these notices, rightsholders demand settlements of up to hundreds of dollars. Google's decision to forward these emails is surprising, as the company generally has a good track record of protecting consumer interests. 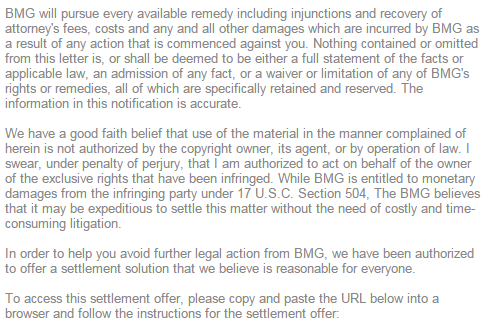 Below Google’s message is the notification with the settlement demand, which in this example was sent on behalf of music licensing outfit BMG. In the notice, the subscriber is warned over possible legal action if the dispute is not settled. “BMG will pursue every available remedy including injunctions and recovery of attorney’s fees, costs and any and all other damages which are incurred by BMG as a result of any action that is commenced against you,” the notice reads. Facing such threatening language many subscribers are inclined to pay up, which led some to accuse the senders of harassment and abuse. In addition, several legal experts have spoken out against this use of the DMCA takedown process. Mitch Stoltz, staff attorney at the Electronic Frontier Foundation (EFF) previously told us that Internet providers should carefully review what they’re forwarding to their users. Under U.S. law they are not required to forward DMCA notices and forwarding these automated fines may not be in the best interest of consumers. “In the U.S., ISPs don’t have any legal obligation to forward infringement notices in their entirety. An ISP that cares about protecting its customers from abuse should strip out demands for money before forwarding infringement notices. Many do this,” Stoltz said. According to Stoltz these settlement demands are often misleading or inaccurate, suggesting that account holders are responsible for all use of their Internet connections. “The problem with notices demanding money from ISP subscribers is that they’re often misleading. They often give the impression that the person whose name is on the ISP bill is legally responsible for all infringement that might happen on the Internet connection, which is simply not true,” he notes. While Google is certainly not the only ISP that forwards these notices it is the biggest name involved. TF asked Google why they have decided to forward the notices in their entirely but unfortunately the company did not respond to our request for comment. Update: Google responded to our inquiry, more details here.